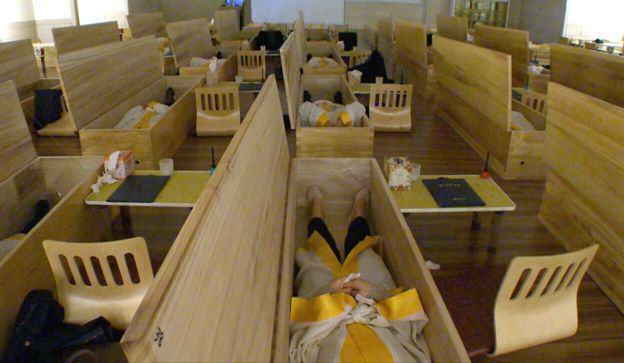 In an unusual effort to combat work related stress, South Korean companies are staging their own mock-funerals. 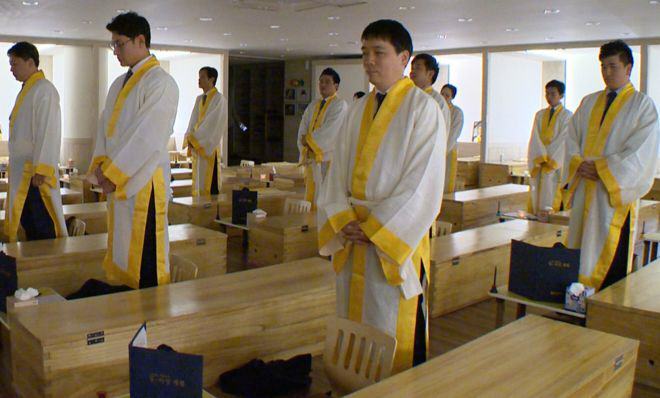 The country has one of the highest suicide rates in the world, so to help people appreciate life, some companies are making employees take part in their own pretend funerals – and they’re really going all out. According to the BBC the employees, whilst dressed in white robes and openly weeping, sit at their desks and write final goodbyes to their loved ones. They then get into wooden coffins specially laid out for them whilst hugging pictures of themselves draped in black ribbon. They are then sealed into the boxes by a man dressed in black who is meant to represent the Angel of Death. 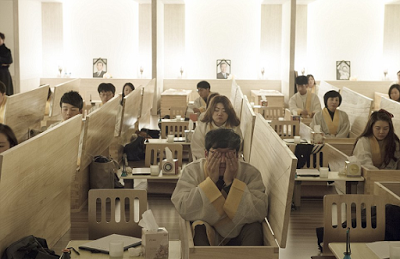 Before undergoing the highly unorthodox ritual the participants are shown life-affirming footage of people overcoming adversity in a bid to help people come to terms with their own problems, which must be accepted as part of life. After the coffin experience, I realised I should try to live a new style of life. I’ve realised I’ve made lots of mistakes. I hope to be more passionate in all the work I do and spend more time with my family. President of human resources firm Staffs, Park Chun-woong thinks his responsibility as an employer extends outside the office, sending flowers to the parents of his employees to thank them for bringing up his staff and insisting that his staff do stretching exercises together every morning, before indulging in a joint outburst of forced laughter. It seems that laughter could be a much needed medicine as The Korean Neuropsychiatric Association found that a quarter of the workers it questioned suffered high stress levels, with work problems the main cause.